The Chalet Dental Care Team understands that being at the dentist makes many people anxious, and we strive to make every appointment a positive experience. Careful listening is job One. As your health partners, we want to hear your primary concerns and anxieties before starting any treatment. We promise never to judge you and only to help you achieve your goals. By combining a gentle touch and the understanding that can only come from years of experience working with anxious patients, we can provide our patients with a comfortable dental experience. We enable patients to enjoy a smile they never thought was possible. We provide you and your family with a safe, clean practice environment filled with state-of-the-art technology and stress-reducing amenities. 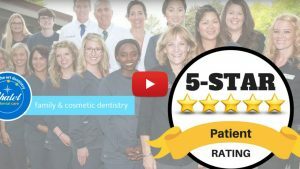 When you combine these with the individualized attention of a friendly, caring team and comforting sedation options, you have the perfect recipe for the most stress-free and enjoyable dental experience you have ever had! Whether it be an additional pillow for neck and back support or waiting an extra few minutes for your tooth to become completely numb, our goal is to make your time with us as easy and stress-free as possible. We have included thoughtful touches that make the difference between an okay dental experience and one you want to tell your friends about. We offer soothing amenities like pillows, blankets, TVs and music in our treatment rooms, and attentive staff who put your needs first every time you visit. SIDE NOTE: Paraffin Hand Wax Treatments are a warm oil-based wax that soothes chronic joint pain and relaxes stiff muscles, and improves blood flow to the area. It increases range of motion for people with arthritis and other chronic conditions that cause pain and stiffness. Paraffin treatments also smooth and soften dry, chapped, rough and scaly skin.